Women have a strong desire for relational connections. Relationships between women can be especially enriching, but when conflict arises, they also can be especially damaging. Too many women approach conflict as if they were unbelievers-with gossip, spiteful actions, bitterness, and even hatred. 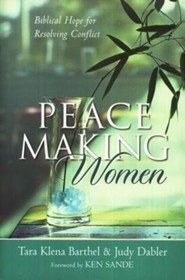 In Peacemaking Women, Tara Klena Barthel and Judy Dabler offer a meaningful, lasting message to lead women out of conflict to a state of peace where they can live as representatives of Christ to one another and well as unbelievers. 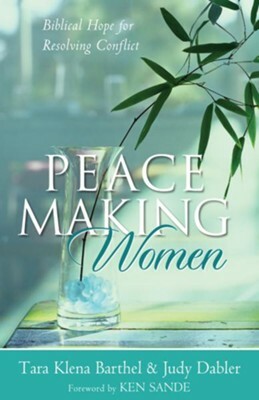 With advice that is firmly rooted in Scripture, the authors bring sound, practical help for women who want to know what the Bible says about conflict resolution and how to achieve peace in their relationships with God, self, and others. Tara Klena Barthel (juris doctorate and M.B.A., University of Illinois Urbana-Champaign) formerly served as the director of the Institute for Christian Conciliation, a division of Peacemaker® Ministries. As such, she oversaw the delivery of all mediation and arbitration services as well as advanced conciliator training. Currently, she serves her family as a homemaker while regularly mediating and speaking on biblical peacemaking. Tara is the vice-president of the board of directors for the Montana Christian Legal Society, an adjunct instructor and Certified Christian Conciliator with Peacemaker Ministries, and a consultant to businesses and Christian ministries on the issues attendant to conflict. Tara, her husband Fred, and their daughter Sophia Grace are members of Rocky Mountain Community Church (PCA) in Billings, Montana. Judy Dabler, president of Live at Peace Ministries (www.liveatpeace.org), serves nationally and internationally as a mediator, counselor, educator, and consultant. Her passion is to see individuals, marriages, families, churches, and communities experience transformation through reconciliation, and is committed to training Gospel-centered reconcilers. Judy holds an MA in theological studies and an MA in counseling from Covenant Theological Seminary as well as a BS in business administration from the University of Missouri-Columbia. Judy is an adjunct professor at Trinity Evangelical Divinity School and an instructor and conciliator for Peacemaker Ministries. She is a licensed professional counselor in Missouri and a Certified Christian Conciliator™ with the Institute for Christian Conciliation™, a division of Peacemaker Ministries. Judy has been married to Jim for over thirty years, and together they have raised two children, Ryan and Robyn. I'm the author/artist and I want to review Peacemaking Women: Biblical Hope for Resolving Conflict - eBook.